As computers have become integral to everyday life as well as in the working environment, gradually replacing many jobs in factories and assembly lines they of course store vast amounts of important information which means they have to be kept in safe PC workstations. 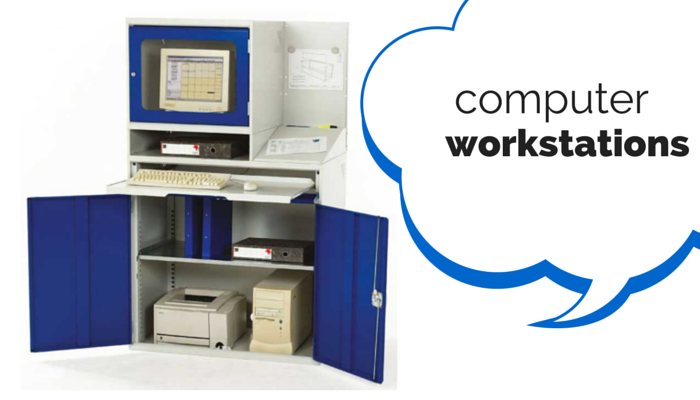 Depending on what you will be using the workstations for there is a vast range available to suit most needs, from enclosed, lockable and even workstations for TFT and CRT. We look at the pc and computer workstations available and what they have to offer. The enclosed top computer workstations are designed to accommodate both TFT and CRT monitors and keeps them safe and secure in an enclosed but with a clear window, so the computer can be used with ease even if the cabinet is locked shut. The workstation is also ventilated, allowing air to flow freely and keep the computer cool. As well as being durable, all cupboards are lockable giving you peace of mind that your equipment and any information stored on the pc is safe and secure. The wider computer workstations are ideal for offices that need a couple of computers but without much space to store them. Great for having a dedicated IT area with a sloped writing surface and enough space in the cupboard for printers, supplies or files and documents with lockable cupboards so you can be sure that everything is safe and secure when you lock up at the end of the day. The flat top computer workstation offers great flexibility as an IT workstation, because of the flat top design it is ideal for rotating and touch screen monitors and has features which gear it towards day to day use. Airflow is very important with keeping computers happy and more importantly running, which is why there are special louvre panels allowing air to pass freely and keep the computers cool. As well as having cupboard space beneath which is ideal for files, printers, and anything else you may need to store.